Ai2s? OBFs? Eiei-o? Decoding Diaper Styles: What Kind Should I Buy? The most complicated decision with choosing to cloth diaper is knowing what brand and style to use. Unlike prior to the 1940s, modern women have a lot of choices when it comes to diapering their kiddos. Since the 1990s, the modern cloth diaper market has exploded into tons of brands, each offering their own take on what they think makes their cloth diaper the best. Snaps, “aplix” (a.k.a. velcro, but they can’t say “velcro” because it’s a licensed, trademarked name), sizes, fabric options, natural vs. synthetic fibers, the options are immense. Not to mention, the cloth world has it’s own set of abbreviations to master like AIO, AI2, OBF, and more- and that’s just the basics! *AIOs (All In Ones) are all one piece (surprise!) so once baby potties, it needs to be tossed in the pail for wash day, and a new one needs to put on the baby. I call these “one and done” diapers. If you go this route, you’ll need 24 diapers. Popular Brands: Grovia, BumGenius, Thirsties, TotsBots, Bottom Bumpers, Smart Bottoms, and Sweet Pea. *Pocket Diapers are two pieces- an insert made of absorbent material and a diaper shell made of waterproof material with a stay dry layer sewn overtop to create a pocket for the insert to slip into. This style of diaper is also a “one and done”. If you go this route, you’ll need 24 diapers. Popular Brands: Lalabye Baby, AppleCheeks, BumGenius, Rumparooz, Tots Bots, Stashologie, Thirsties, SoftBums, FunkyFluff. 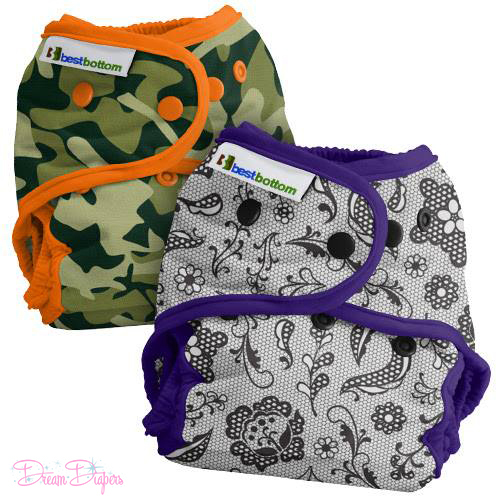 *AI2s (All in Twos/Hybrids) are two pieces- a diaper shell made of waterproof material and an insert made of absorbent material. Inserts can snap into the shell or simply lay inside the shell, but the insert does not rest inside any kind of “pocket” in this case. So, if baby potties and it only gets on the insert, you simply change out the insert for a new one and reuse the shell. Since the shell is the more expensive part, you save money because you can reuse the shell a few times (usually) before needing to use another. If you go this route, you’ll need 24 inserts (of your choice) and around 6-8 shells. Popular Brands: Lalabye Baby, Grovia, SoftBums, FunkyFluff, Stashologie, Best Bottoms, and Flips (BumGenius). *Fitteds and Covers (Including Wool Covers) This is a two piece system that you buy separately, sometimes even purchasing the fitteds in one brand and the covers in another depending on your style. A fitted is a diaper that is made completely of absorbent material- there is no water-proof portion to the diaper whatsoever. (What? Why would I want that? I don’t enjoy getting peed on…)….so you have to put a cover overtop of the fitted. Covers can be made of the typical waterproof materials (TPU/PUL) that are used in pockets, AIOs, and AI2s and contain no stay dry pocket layer sewn over top. 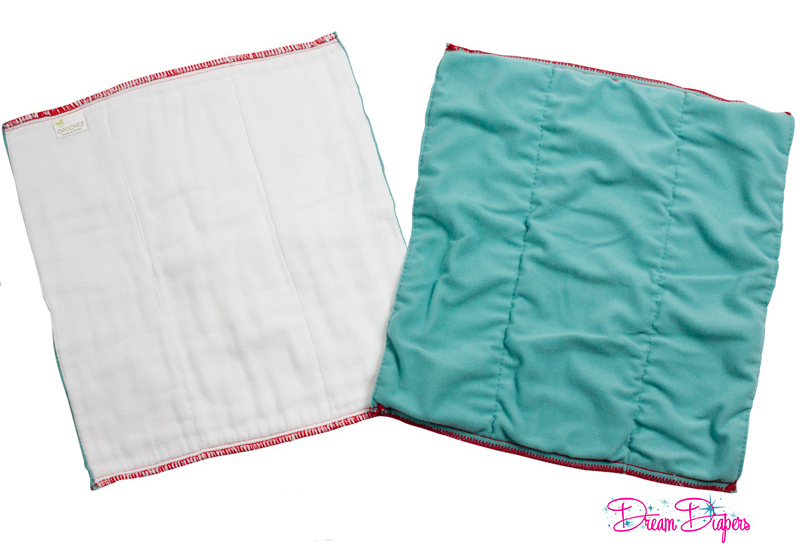 Therefore, the PUL/TPU is exposed, which makes it easily wipe-able and quick to dry between diaper changes. For example, have Cover A dry out while you use Cover B and then go back to Cover A at the next change. Or, you can choose wool covers. Wool is “bullet proof” for super-soakers (meaning your kid pees A LOT more than the average babe), but the catch to wool is that it requires special laundering, which we are all too happy to help you with! If you go this route, you’ll need 24 fitteds and around 6-8 covers. Popular Brands of Fitteds: Sustainablebabyish, Sloomb, BinkyD, Sweet Pea, Little Boppers, and Tiny Tush. Popular Brands of Covers: Rumparooz, Bummis, Thirsties, Sweet Pea, Tots Bots, Stashologie, Best Bottoms, and Blueberry. 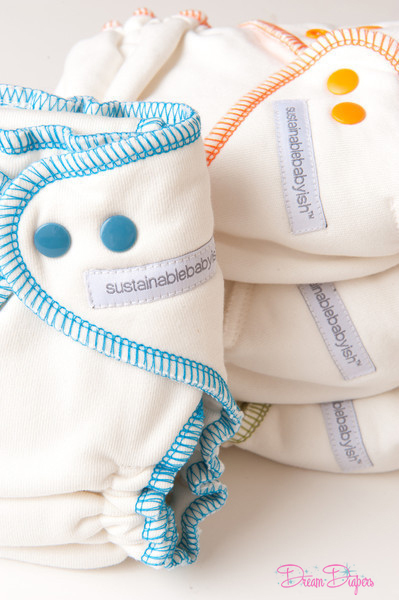 Popular Brands of Wool Covers: Sustainablebabyish, WoollyBottoms, and Sloomb. *Prefolds/Flats and Covers Same concept when it comes to covers, but instead of using a fitted underneath a cover, you use prefolds instead. Prefolds and Flats are the cloth diapers of yore- wrapped around baby using what I like to call “cloth-origami” folding techniques and secured with (NOT A SAFETY PIN- c’mon, people, we’re more advanced than that now!) a Snappi or similar closure device (which can be reused over and over and over again and doesn’t run the risk of impaling the baby like a pin does). There are several videos on YouTube demonstrating how to do the various folds for securing the prefold/flat to baby’s bottom. Once the prefold/flat is securely on the baby, the cover is put overtop to create that waterproof layer our laps appreciate so much. Some people forego the cloth-origami and simply pad fold the prefold and lay it in the cover. Whatever floats your boat, momma! If you go this route, you’ll need 24 flats/prefolds (or more if you want, they’re cheap) 6-8 covers, and 2-4 Snappis or some kind of closure option. (I have to confess here: you can use safety pins. Many people still do. I don’t find them as easy to use, but it’s totally your call!) Popular Brands of Prefolds: OsoCozy, Sustainablebabyish, Grovia, Bummis, Smart Bottoms, Geffen, Sweet Pea. Popular Brands of Covers: Rumparooz, Flips (BumGenius), Bummis, Thirsties, Sweet Pea, Tots Bots, Stashologie, Best Bottoms, and Blueberry. My best advice is this: when you start out- try out a few different brands. Once you find what you like best, then you can invest in an entire stash of that brand and sell off the ones you didn’t like (a huge benefit to cloth!). If you purchase brands that you’re not sure about gently used, that can ease the cost burden of branching out to try a few different brands. Also, ask yourself: who will be changing baby most often? (Dad? Mom? Grandparents? Daycare staff?) And what style would that person be most comfortable with? Go with that style. If you’re not sure the answer to that, get a few of the styles that interest you to try out before you make your decision. If you don’t want to try a bunch of different brands or styles, you just want to pick one and go with it, that’s your call, obviously, but I would recommend at least looking at the diapers you want to purchase in person if you can before investing in an entire stash of the same brand. 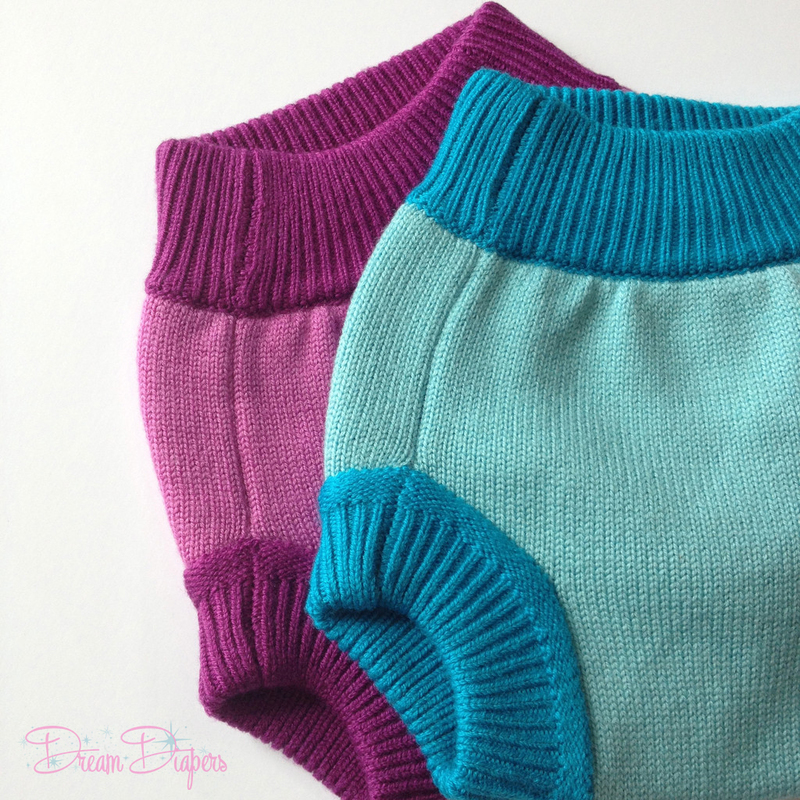 You can also ask others what has worked for them in our Stash Chat (our exclusive Facebook group- you will receive a request to join once you purchase something from Dream Diapers) to get ideas on what style might work best for you and your family. If you have any further questions about different styles of cloth diapers, please comment below! We are here to help! If you’re ready to add some fun new styles of fluff to your registry or shopping cart, we carry all the brands and styles listed above at Dream Diapers.com! Previous Post I Want To Use Cloth Diapers: What Do I NEED?